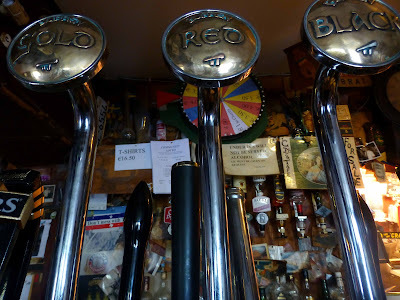 When you walk into the Roadside Tavern in Lisdoonvarna, you see the normal beer dispensers on the high counter. But then, in the middle, you see something totally different: three unusual taps labelled Gold, Red and Black. 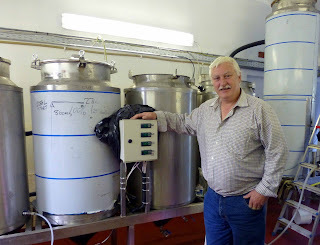 Owner Peter Curtin has his own brewery here, “the smallest micro-brewery in Ireland”, and the taps, designed by a local artist, dispense his lager (Burren Gold), ale (Burren Red) and stout (Burren Black). And very tasty they are too, as we discovered after a tasting of the three. The brewery, just over 12 months old, is upstairs and Peter showed us up his stairway to heaven! It is all neat and compact. He has got some very good gear here and a great love for the task as we found out. And the pub is the only place that you can get these beers. 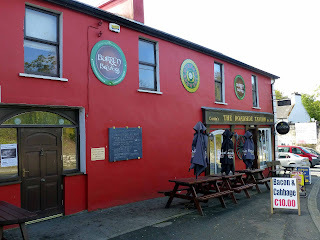 The pub itself, just a few miles from the Burren and the Cliffs of Moher, has a very long history, in family hands since 1893. But the Curtins were also bakers and that history goes back even further, hundreds of years. Nowadays the pub is also noted for its food and, this year, was voted “Best Gastro-pub in Munster” by the Restaurants Association of Ireland. Timing wasn’t quite right for us to eat there but the menu is filled with delicious dishes such as traditional Irish bacon, Cabbage and Parsley sauce and a slightly less traditional rendition of Irish stew (featuring local Burren beef in place of the more typical lamb). 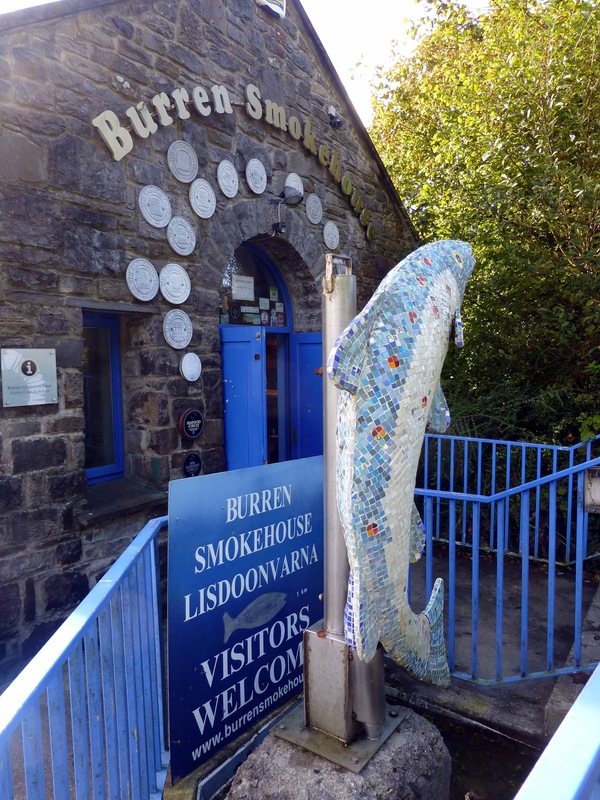 Pride of place is given to several dishes featuring Smoked Fish and Eel from the family's award-winning Burren Smokehouse, run by Peter and Birgitta Curtin. Try the Burren smoked fish platter which is served with organic leaves from nearby New Quay. The Burren Smokehouse is literally a few yards down the road and well worth a visit. And they have a great shop there too with local products from other producers. You may also buy online. And don’t skip dessert in the Tavern. Peter says they are fabulous, homemade by Fabiola's Patisserie in Doolin. Fabiola has worked in Michelin starred restaurants and you may also sample her pastry delights at the Cafe in the Doolin Crafts Centre. Food and good beer. What more do you want? Well, you get much more in this bar as there is a fantastic music programme throughout the season. That series is drawing to a close now but not before paying a massive tribute to Micilín Conlon (who played in the pub for all of 57 years) over three nights (26th,27th,28th of October). And, on the Saturday and Sunday (4.00 to 6.00pm), there will be a tasting combining the local beers, breads and cheese. Sounds great. If you like a laugh, you’ll never be short of one with Peter and his crew in the Roadside. His sense of humour was seen at its sharpest recently when he more or less hi-jacked the Thursday set aside for Arthur and instead designated it Peter’s Day with pints of Burren Beer selling at three euro. The beers are very popular with tourists. They are good, really good. So why not call in if you are in the area. Worth a detour, as they say in the best guides.